The future of transport is evolving rapidly. Advancements in automotive technology are already impacting our perceptions of what commuting and mobility will look like in the approaching years. Change is coming - it’s happening - and in some ways it’s already here, and we need to be ready. One very clear example of this is the development of automated vehicles (AVs). At present, partially-automated vehicles (semi-AVs) are available to the public and offer a range of Advanced Driver Assist Systems (ADAS), such as Lane Keeping Assist (LKA), and Adaptive Cruise Control (ACC), amongst others. These systems are able to augment the driving experience, and can change the way in which the operator of the vehicle ‘drives’, making it imperative that the capability of these semi-AVs is understood. To assist in gaining this understanding, ARRB, in collaboration with ConnectEast, has been leading a project for VicRoads on investigating the capabilities and the driver-vehicle and vehicle-infrastructure interactions of semi-AVs. This project in its initial stage has involved trialling 14 different vehicles on Eastlink (a privately-owned tollway in suburban Melbourne), and qualitatively assessing the performance of the ADAS in each vehicle. Reduction in driver fatigue eg. micro-steering adjustments can be made by the LKA to reduce the mental load of the driver. Improved driver-hazard awareness eg. Detection and warning systems (e.g. blind spot detection, and collision warnings) can alert the driver to a hazardous situation to increase response times and improve likelihood of accident mitigation. To further improve the understanding of these features, ARRB organised for five semi-AVs to be present for the workshop. 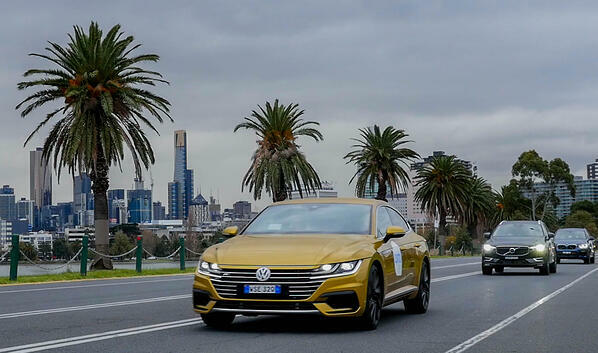 This allowed the VicRoads staff to personally see and experience the current AV technology by taking those interested on a 20-30 minute demonstration drive, accompanied by a film crew to assist in documenting the process. This process of disseminating the project findings was able to pique interest from areas within VicRoads, such as those dealing with infrastructure standards and with driver licensing. Questions were raised about what changes or considerations may need to be made in these areas, to ensure that these vehicles are used safely by the public. One such question highlighted a potential need to re-test licensed drivers of semi-AVs to ensure that they are able to properly handle/supervise their vehicle when employing ADAS. A key point was also made about the need to ensure that the automated systems can reliably navigate the road pavements and easily recognise and stay within their driving lanes. This notion allowed the importance of good quality road surfaces and line marking to be discussed and highlighted as a large contributor to the safer and more predictable operation of these vehicles. Overall, this project is enabling steps to be taken in the journey towards adapting to the evolving technology in this automotive space, with the first stage proving useful in understanding the way the driver and vehicle interact, as well as experiencing the interaction between the current infrastructure and the vehicle. Stage two of the project is now already underway, exploring the effect of connecting the AVs to the environment/infrastructure around them.